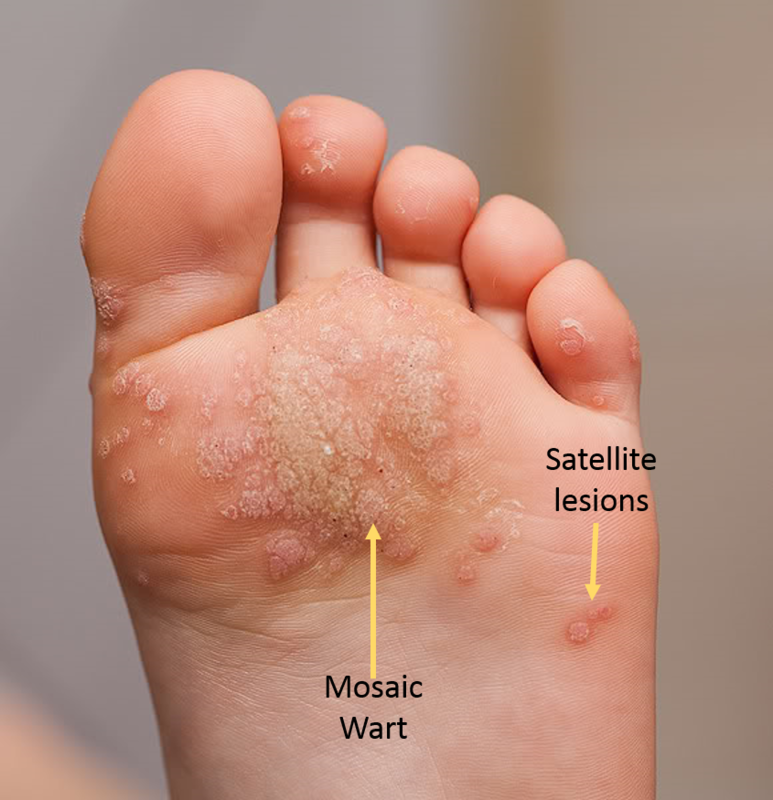 Warts are caused by a virus that lives between the layers of skin on the bottom of the foot. Your body's immune system does not actually detect the virus as something that should not be there, so the virus happily spreads under the radar, undetected, to other parts of the foot or even the other foot. They actually create their own blood supply through recruiting and causing the skin to develop tiny blood vessels (called capillaries). Our bodies create calluses overtop of warts as a protective mechanism. When you come in to be treated for warts, one of the first steps is to carefully scrape away this extra, dead skin to expose the wart where it lies underneath. This process is not painful, just feels like some pressure and scratching. Once we have exposed the wart itself, the treatment continues with the application of a high grade acid. This acid serves to; 1) cause a response in the skin surrounding the wart so the virus does not want to stay and eventually leaves, and 2) it helps activate your immune system to recognize that the virus shouldn't be there, further recruiting cells to fight the virus. Because your own body's immune system is working to fight the virus, with lots of care and persistence, the wart eventually leaves and stays away, thus the high success rate and lower chance of recurrence. Getting rid of a wart is a team effort. While we are here to trim the callus and apply the medication to initiate treatment, success is also dependent on what is done at home. We recommend a product called “wart stick,” which is a 40% salicylic acid product. This helps to continue treating the wart in between visits to the office. In some cases, warts are extraordinarily virulent and difficult to get rid of. This is sometimes related to their size and the number of warts present on the feet. Our office can also prescribe a topical cream to apply to the warts in between appointments and this compound works well for more difficult warts. This topical cream may also prove useful in any size of wart that does not respond predictably by the third office treatment. Past wart treatments you may have heard of before include freezing a wart. There are also acids that are available over the counter that you may have even tried to cure a wart. Freezing a wart is an acceptable form of treatment for warts that are present on hands and other parts of the body that are non-weight bearing – meaning parts of the body where the skin is thin. The skin on the bottoms of our feet is thicker and the freezing treatments are less effective because the cold is not able to always penetrate to the wart within the deeper layer of the skin. If you have questions on how to treat a wart on the bottom of your foot, or you are not even sure if what you have is a wart, make an appointment with one of our doctors. We will perform a thorough exam and come up with a treatment plan to get rid of it!